It's as simple as contacting us by phone to request a pick up. We have daily runs through Hamilton and surrounding area and will pick up or deliver to your home or office. 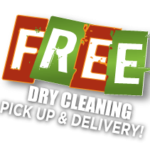 Our service turn around is 48 hours making it a quick and convenient option for all of your Laundry and Dry Cleaning needs. We're sure your schedule is busy enough; let us show you what we can do. Our Valet Service is available Monday, to Friday, 12:00pm to 5:00pm. We also offer a Rush Valet Service, returning your items on a 24-hour turn around. Just inform us if you prefer this at the time of ordering. Minimum order of $30.00 before taxes.